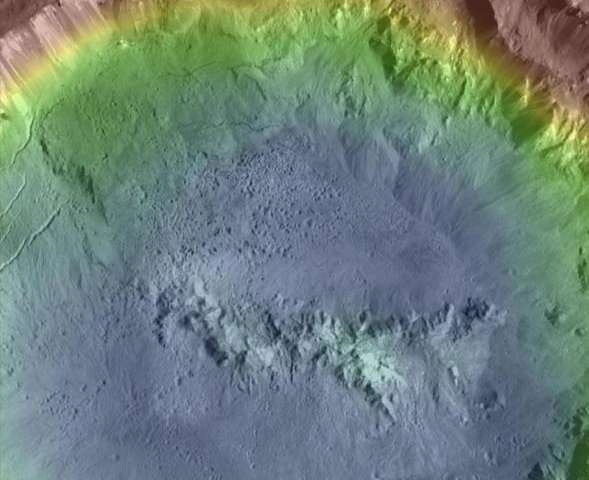 Pitted terrains inside fresh complex craters on Ceres are similar to terrains seen Mars and Vesta, and are likely formed through the rapid evaporation of subsurface H2O, a new paper by Planetary Science Institute Research Scientist Hanna G. Sizemore says. "Pitted terrains may be common morphological markers of volatile-rich near-surface material in the asteroid belt," Sizemore said. Sizemore is lead author of "Pitted Terrains on (1) Ceres and Implications for Shallow Subsurface Volatile Distribution" that is published in Geophysical Research Letters. PSI scientists Norbert Schorghofer, Thomas H. Prettyman, David A. Crown, Scott C. Mest and R. Aileen Yingst are among the co-authors on the paper. "Wherever we send a spacecraft into the Solar System, we're always asking, 'Is there water? Is there ice?' Both questions are important because we're interested in habitability, and because water is a resource that will be needed for manned exploration," Sizemore said. When pitted crater materials were first described on Mars, they were cited as evidence that even the "dry" low latitude regions of Mars are somewhat ice-rich. When pitted materials were discovered on Vesta, there was a lively debate about whether the water that formed the pits was sourced from Vesta, or whether the impactors that hit Vesta brought it in. "Now, we've found this same type of morphological feature on Ceres, and the evidence suggests that ice in the Cerean subsurface dominated the formation of pits there," Sizemore said. "Finding this type of feature on three different bodies suggests that similar pits might be found on other asteroids we will explore in the future, and that pitted materials may mark the best places to look for ice on those asteroids. "We used numerical models to investigate the formation of pitted materials on Ceres, and investigated the relative importance of water ice and other volatiles in pit development there," Sizemore said. "We concluded that water ice likely plays a key role in pit development on Ceres. Similar pitted terrains will be of interest to future asteroid missions motivated by both astrobiology and in situ resource utilization."